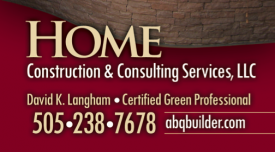 This is the home that we entered in the 2011 Spring Parade of Homes, in Albuquerque, New Mexico. We met this client during the 2009 Fall Parade of Homes and worked with them through the conceptualization, design and construction phases of the project. By doing this, we were able to eliminate any potential issues that might arise during the course of construction, decrease the amount of time devoted to construction and reduce the amount of interest that was paid on the construction loan. By working in this manner, and providing the client all of our negotiated discounts, we were able to save them approximately half of the cost that we charged to construct the home, which is typical. The home was very well appointed on the interior and the owner did s wonderful job selecting colors and finishes. Everything was very consistent throughout and the home had an excellent “flow”. Additional photographs of the home can be seen here. We had five different types of wood in the home, all of which were color-matched to the Mahogany floor, which was selected first. The brushed/satin nickel hardware finish was consistent throughout and included the lighting fixtures, plumbing fixtures, door hardware and even the bathroom accessory pieces. The paint colors blended wonderfully with the flooring and carpeting and were very “soothing” and relaxing to look at. Quite often, when you go into a home, you will see multiple wood colors, stark paint colors, finishes that do not match and it seems as though the items in the home were selected based upon what was found that was on sale at the local “big box” stores. This was certainly not the case in this home and the home is a very “pleasant” home to be in. We received phenomenal feedback during the Parade and the quality of the finishes and the consistency throughout the home were commented on by a multitude of people. What a wonderful thing for the Owners to receive such pleasant and positive feedback from the members of the public who toured their home. Some of the features of the home included cellulose insulation, custom milled baseboard, Level 4 3cm granite, custom fixtures, mahogany flooring, Pella windows and doors, expansive entertaining areas, a wonderful rear portal for entertaining purposes, tongue and groove planking on all exterior ceilings, beautiful interior doors, custom inserts in the Master Closet, R-50 insulation in the ceiling, consistent tile and glass inserts throughout the home … a truly unique home that was designed, built and finished exactly to the client’s specifications. This home was also featured in the May 8, 2011 Albuquerque Journal, of which you can read the article here.